It's 08:54 in Parga, Greece right now. Beach Nice view over the beach of Parga. 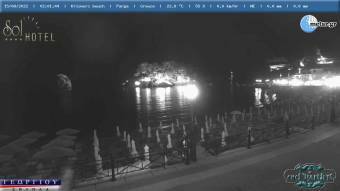 Parga: Livestream Krioneri Beach, 0 miles away. Preveza: View towards Lefkada, 29.6 miles away. Kanoni (Corfu): Flisvos Seaside Cafe Restaurant, 33.6 miles away. AIDAblu: BowCam, 35.7 miles away. AIDAblu: View from the Port Side, 35.7 miles away. AIDAblu: View from the Starboard Side, 35.7 miles away. Kompoti: City View, 38.8 miles away. Corfu: Webcam Arillas, 41.5 miles away.